Now is the movie-viewing winter of our discontent. It’s common to refer to the first month of the year as a dumping ground for unpromising fare. “Ashes in the Snow,” directed by Marius A. Markevicius from a script by Ben York Jones (adapting the young adult novel Between Shades of Gray by Ruta Sepetys) has an opening title card of the sort I’ve come to dread: “Inspired By True Events.” The reason for my dread lies in what those words avoid, which is responsibility. If you say something is “based on” “truth” or “a true story,” you’re holding yourself at least a little bit accountable for something. If you’re just going with “inspired” by “events,” you’re asking for credibility while also trying to get off a hook or two. The historical fact upon which this picture is premised is the Soviet Union’s deportation, at certain times during World War II, of inhabitants of several Eastern European countries to hard labor camps in Siberia, for many a sentence equivalent to death. Prison camps and communities in the far reaches of Siberia stretch back to the days of the Czars; post-revolution Russian despots put new, cruel twists on them. 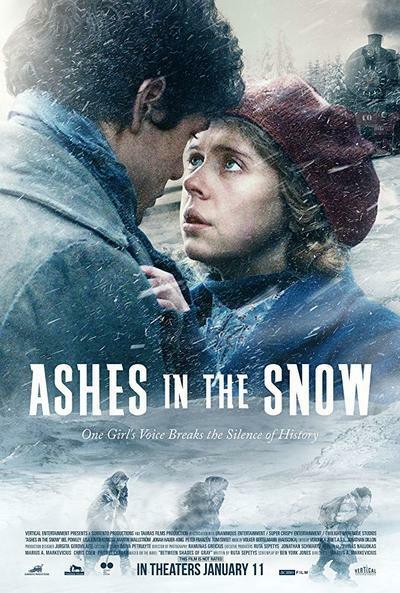 In “Ashes in the Snow,” the focus is on talented young Lina, a citizen of and living in Lithuania played with wide eyes and a general sense of troubled quietude by Bel Powley. A talented graphic artist, she seems to her mother Elena to be too withdrawn. But to her noble, compassionate father, she is a genuinely inspired soul. Their sunny family life—pre-arrest life, as seen in the beginning of the film and in subsequent flashbacks, is pretty much the only time in Lina’s life in which the sun is seen shining—is disrupted by an arrest of the whole family, and father is separated from the rest of his brood as Lina and mom and others are herded into trains headed for the remote region of Altai. There is much that is familiar in this film, both in terms of formal approach and action. The ostensibly Lithuanian characters all speak English while the arresting and imprisoning soldiers bark in Russian. To underscore the horror of the prison-bound women’s situation, an infant dies on the train and a soldier refuses to allow its burial. Anybody speaks up in a way that irritates a particular Russian and it’s off to the side, on your knees, and boom, a bullet to the back of the head.